Located in northwest Washington, D.C., Battleground National Cemetery is one of the smallest national cemeteries in the country. The cemetery is the final resting place for 41 of the Union soldiers who fought at the nearby Battle of Fort Stevens, the only Civil War battle fought in the District of Columbia, and the only military engagement in United States history in which the president came under direct fire. The cemetery features four monuments honoring the Union soldiers who participated in the battle, and retains its original superintendent’s lodge, which dates to the 1870s. Battleground National Cemetery is one of 14 national cemeteries managed by the National Park Service. Today the cemetery is part of the National Park Service’s Civil War Defenses of Washington and Rock Creek Park. On July 11, 1864, Confederate troops, led by General Jubal A. Early, reached the outskirts of Washington, near present-day Silver Spring, Maryland. As Early’s men rested, Union reinforcements arrived at Fort Stevens, one link in a chain of defenses that surrounded the nation’s capital. The next morning, Union troops fought off Early’s first advance and that afternoon the Confederates retreated from their positions. From Fort Stevens, President Abraham Lincoln observed the fighting, coming under fire from Confederate snipers. Though the Union lost 59 soldiers, they were successful in driving the Confederates from Maryland and defending Washington. Shortly after the battle, Quartermaster General Montgomery C. Meigs selected a site one half-mile north of Fort Stevens to bury the Union casualties. The one-acre site is roughly square and sits on a terrace approximately five feet above the street elevation. A coursed bluestone wall along the western edge is broken only for a set of stairs leading to the only entrance to the cemetery, a wrought-iron pedestrian gate. On either side of the gate are stone pillars, each topped with a Civil War-era six-pounder cannon, one pointing north and one pointing south. From the gate, a paved walkway heads east where it loops between the flagpole and the grave markers. A four-foot tall rubble bluestone wall encloses the north, east, and south sides of the cemetery. Near the entrance is a row of four monuments, each dedicated to a regiment that fought to defend Washington at the Battle of Fort Stevens. From north to south, they are the 150th Ohio National Guard Monument, the 122nd New York Volunteer Monument, the 98th Pennsylvania Volunteer Monument, and the 25th New York Volunteer Cavalry Monument. Dedicated in 1907, the Ohio National Guard Monument consists of a six-foot tall stone memorial, flat and polished on the front and back, and rough along the sides and the curved top. The New York Volunteer Monument, erected in 1903, is an 11-foot tall stone obelisk listing the names of the regiment members killed in the battle. The Pennsylvania Volunteer Monument is a nine-foot tall obelisk that lists the names of those soldiers killed. The dedication of the New York Volunteer Cavalry Monument in 1914 marked the 50th anniversary of the battle. The memorial features a life-sized statue of a cavalryman, which sits on a six-foot tall stone base. The cemetery’s superintendent’s lodge is at the southwest corner of the site. Built in 1871, the lodge was constructed of red stone and features the distinctive mansard roof common to lodges designed by Quartermaster General Montgomery Meigs. The other major structure at the site, the marble rostrum, is located just east of the flagpole, in line with the entrance. The rostrum has eight Doric columns, four each on the east and west elevations, with a marble block wall running between the column rows. The rostrum was dedicated in 1914 and is the location of the cemetery’s annual Memorial Day services. Battleground National Cemetery is located in the 6600 block of Georgia Avenue, NW, in Washington, D.C. 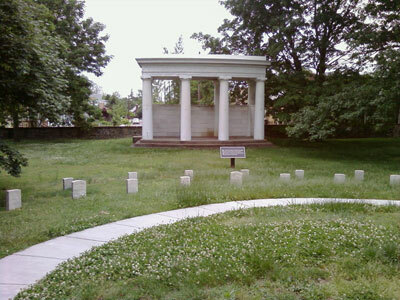 The cemetery is part of the Civil War Defenses of Washington and Rock Creek Park, a unit of the National Park Service. Click here for the National Register of Historic Places file: text and photographs. The cemetery is open for visitation daily from dawn to dusk, and is closed on New Years Day, Thanksgiving, and Christmas Day. For more information, please contact the Rock Creek Park office at 202-895-6000, or see the National Park Service website. While visiting, please be mindful that our national cemeteries are hallowed ground. Be respectful to all of our nation’s fallen soldiers and their families. Additional cemetery policies may be posted on site. The Civil War Defenses of Washington consist of sites in the District of Columbia, Maryland, and Virginia, including 16 forts, two batteries, and Battleground National Cemetery. The superintendent’s lodge at Battleground National Cemetery has been documented by the National Park Service’s Historic American Buildings Survey.